MacEachern, Sherry Ann (Lynds, Tingley) - New Minas (formerly of Truro), NS. It is with sadness that we announce the passing of our mom and grandmother on December 2, 2018, at age 80 in New Minas with her loving partner Eric by her side. Mom was born on April 19, 1938, in Springhill, NS. She was the only daughter of Mona (Tabor) and Irvin (Whackey) MacEachern. She attended Aberdeen Hospital School of Nursing in New Glasgow, NS from 1955 – 1958. After receiving her RN diploma, she worked at Colchester Hospital, Truro NS until 1979. 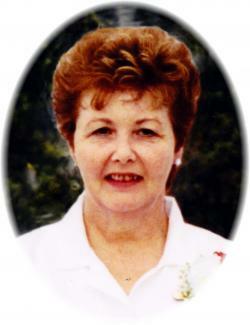 She worked at Glenview Lodge Nursing Home in Salmon River and was Director of Nursing for 14 years. After resigning her position, she continued to work there as an RN and later at the Mira Nursing Home in Truro until her retirement in 2003. She had been a cancer survivor since 2005. In 2007 Mom, with our blessing, moved to New Minas to start a new life with Eric Cox, her loving companion and dearest friend. Together they attended United Baptist Church in Port Williams, where she became a member of the Loyal Workers. She was a member of the New Minas and District Lions Club and a member of the Valley Apple Blossoms Red Hat Society where she got such a kick out of donning her red hat for many joyous outings. Mom met many wonderful and caring friends in the Valley. Among those were Eric’s family who crawled into her heart and stayed there. She was overwhelmed. Mom was a caring, faithful friend and mentor to many. She was a fun-loving spirit with a quick wit. She expressed her creativity through many forms of art and could master any craft that took her fancy. Our Mom loved animals, especially dogs, and they returned her devotion. She was a fiercely proud and adoring mother and grandmother who showered us with her love, support, and encouragement. Mom had a special, unbreakable bond with her two granddaughters; Garrett and Rebecca. They were her joy, her moon and stars. They were loved unconditionally as were we. Mom is survived by us, her daughters, Patricia (Lynds) Yorke and Wendy Lynds (Anthony Purdy); beloved granddaughters, Garrett Lynds (Mike Stewart) and Rebecca Yorke; dearest love, Eric Cox and family; sister- in-law, June MacEachern; nieces and nephews. She was pre-deceased by her parents and two older brothers; Don MacEachern (Shirley), Ron (Budd) MacEachern. By Mom’s request there will be no visitation, flowers or funeral service. Cremation has already taken place. Private interment at Valley Cross Roads Cemetery, Colchester County NS. Donations in memory may be made to a charity of your choice. Arrangements have been entrusted to the White Family Funeral Home and Cremation Services, Kentville.